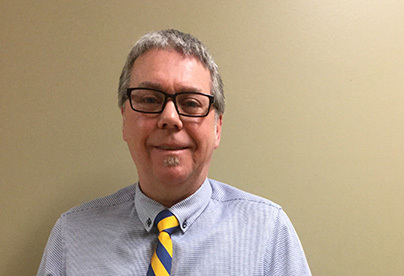 When learning CPR, people don’t usually think of using it in a situation involving zombies or an impending apocalypse – but that proved to be one teacher’s innovative way to reinforce the lesson to students at St. Johns School in St.Jean-sur-Richelieu, QC. McGuinness sought to capitalize on popular shows such as AMC’s “The Walking Dead” to inspire the students to take a more active participation. 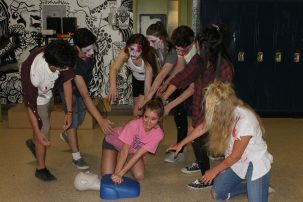 The result was an exercise dubbed “Zombie Apocalypse,” where students had to actively search for CPR practice mannequins that were hidden around the school. “I came up with this idea and my colleague got on-board right away. We planned it out together and decided where to place the mannequins in the school, and who to involve,” explains McGuinness. “We approached the people we knew would be receptive.” The added benefit to getting broader participation is that it broadens awareness and serves as a refresher to others in the school beyond the students. So how exactly does the simulation of a “Zombie Apocalypse” work? During the first of the two classes, McGuinness reviewed the theoretical and practical aspects of CPR with his students. Using peer feedback, the students were given ample time to practice. Before the second class, participating staff members (teachers, administrators, support staff) hid CPR mannequins in various places throughout the school. The class was then split into groups of three, with each group given one of the school’s 10 iPods to film their resuscitation endeavours. The students sought out as many mannequins as they could find, whether in the cafeteria, the gym, the principal’s office – but always within view of a responsible person. 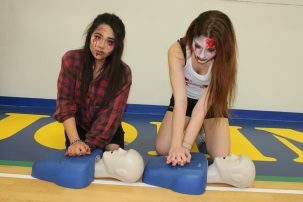 The exercise took an interdisciplinary twist as Secondary III drama students, dressed as “real” zombies, lurked the school halls in search of survivors. When the students uncovered one of the mannequins, they had to transition to ensure each member of the group performed CPR, while the other teammate captured their efforts on video for evaluation. If a zombie approached a team as they were working on a mannequin, they had to abandon the mannequin, and find a new one. “The addition of the zombies was a huge hit, and the students have asked if we might be able to repeat the exercise once more before they graduate,” says Anthony. The students then returned and submitted their iPods to the supervisors, who were armed with checklists to ensure all the right steps had been followed: each resuscitation had to include the right technique and all the steps necessary in accordance with the ACT CPR and AED Program. The staff reviewed the videos and determined if the resuscitation was sufficient to prevent the mannequins from “turning” into zombies – only by performing proper CPR techniques could the Apocalypse be prevented. The ACT High School CPR Program was set up at St. Johns School in 2006, thanks to generous support of the Government of Quebec that enabled the donation of mannequins, teacher training and curriculum resources. ACT’s national health partners supporting the program in St.Jean-sur-Richelieu, throughout the province and across Canada are AstraZeneca Canada, Pfizer Canada and Sanofi. They provide ACT’s sustaining funding and are committed to the Foundation’s national goal of promoting health and empowering Canadians to save lives. The Advanced Coronary Treatment (ACT) Foundation is an award-winning, national charitable organization dedicated to establishing CPR and AED training in high schools across Canada. ACT raises funds to donate mannequins and teacher training to schools, and guides schools in program set-up and long-term sustainability. More than 2.9 million youth have been trained in CPR by their teachers through this lifesaving program to date.